Maignes syndrome is thoracolumbar pain that radiates into the buttock. 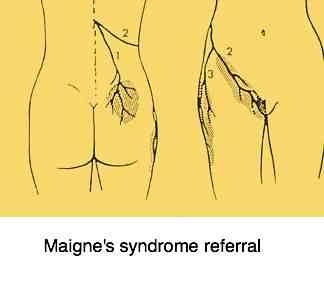 Maignes syndrome comes from thoraco lumbar region to the side of thigh and groin too. Common symptoms are often confusing and overlap with many other conditions. Groin discomfort for example occurs in many diseases; you can't simply assume that you are suffering from this upper lumbar problem. That part between the lower spine and the midback, where you can feel the last rib, is called the thoraco lumbar region. This condition causes lower back and buttock ache, and often upper leg and sometimes groin discomfort. The thoraco lumbar junction syndrome, as it is sometimes called, has been thought to be responsible for up to forty percent of common LBP. This percentage is subjectively based upon Dr. Maigne's personal statistical study of 500 cases and is, in my opinion, rather high but the upper lumbars are certainly often neglected as a source of referred lower back pain. Because Maigne's syndrome makes for a diagnostic nightmare, it is often overlooked, causing possibly years of unnecessary pain and disability. Read more from the case file found lower down. As always, not more tests, but a thorough clinical examination is required. Is there a spinal fixation at the thoraco lumbar junction? Is the active trigger point in the quadratus lumborum really an incidental finding? Is the pain in the groin or lateral thigh from a femoral nerve lesion, maignes syndrome, hip arthritis, and so on? Back, buttock pain and the groin too, perhaps. Dr Robert Maigne, a French orthopaedic specialist, proposed that low back pain could in fact originate from the thoraco lumbar facet joints, mediated by the superior cluneal nerves, lumbar nerve roots 1, 2 and 3, now known as Maignes syndrome. They supply primarily the upper buttock but also sometimes the groin. A careful examination of the sacroiliac joints, the piriformis, the hip is always in order. Pain in the buttock and groin areas can come from so many different sites. Inguinal hernia, testicular cancer, swollen lymph nodes? Prostate cancer, the most common fatal cancer of men, should always be upper mind, and not only in the older patient. Controversy reigns in medical circles concerning the best routine examination for prostate cancer, so we at chiropractic help will stay out. Nevertheless, prevention of all cancers but particular of the not uncommon breast and prostate cancers, is vital in chiropractic practice, because of their tendency to metastasize frequently to ribs, the spine and pelvis; areas treated on a daily basis at the chiropractic coalface. The short answer is every man shall eat a tomato a day, and avocados regularly, and women must reduce animal protein; and take hormone replacement therapy only in cases of extreme necessity. 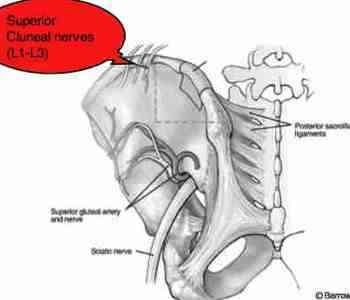 Superior cluneal nerves supply the buttock and according to some authorities there are slips that innervate the skin in the groin area. The dermatomal distribution of the cluneal nerves and the lateral femoral cutaneous nerve, LFCN. Google appears to frown on too many links, so phrases in bold, like that Maigne syndrome casefile below, need to be put into the Site Search function in the navigation bar on your left if you want more information. As we shall see, a very similar syndrome originating from this region, but involving the lateral femoral cutaneous nerve, lumbar 2 and 3, a branch of the femoral nerve. The syndrome has no name, so I lump it in with maignes syndrome, though technically it's not; it causes pain and numbness on the side of the thigh and or the groin area. More complex, this lateral femoral cutaneous nerve may be involved in a double crush syndrome where there is often a subluxation in the upper lumbar spine, and the nerve is crushed in the groin giving symptoms on the lateral thigh only. Then it's called meralgia paresthetica. A syndrome simply means a collection of seemingly unrelated signs and symptoms. Buttock and LBP are typical of maignes syndrome, but groin pain perhaps, lateral hip and thigh numbness, an anterior thigh burning sensation may all be mimicked by this condition via the lateral femoral cutaneous nerve. However, as I said, this is not technically Maigne's syndrome. Other conditions often causing buttock pain and affecting this area are the piriformis syndrome, a small buttock muscle through or around which the sciatic nerve must negotiate its way to the leg. The side of the thigh is also occupied by the iliotibial band syndrome, a long band of tissue stretching from the tensor fascia lata muscle to the side of the knee. Another condition is the femoro acetabular impingement syndrome which also can cause groin and side of the hip pain. It is characterised by stiffness in the hip, and may be found in young people. Another is hip dysplasia; mild cases are often missed causing upper thigh and groin pain. These lead unerringly on to premature hip arthritis if not managed carefully. These are conditions that chiropractic excels in. Well, hip arthritis in its early to moderate stages. Thereafter it's a surgeon's work. But, it's a highly complex area also involving medical conditions like an inguinal hernia, aneurisms in one of the iliac arteries, lymph nodes, and many others. Your chiropractor will make a careful examination of the area, and may well ask for a second medical opinion. To adequately diagnose and treat the myriad of conditions around the low back, buttock pain, groin and thigh really requires good teamwork. Unfortunately Chiropractors are not yet considered part of this team by the majority of the Medical community - to the detriment of the patient. This is why there is a strong move in Chiropractic to vacate the Complementary-Alternative-Medicine (CAM) camp and join the Medical community proper. This movement has its critics - they fear we could lose our identity. 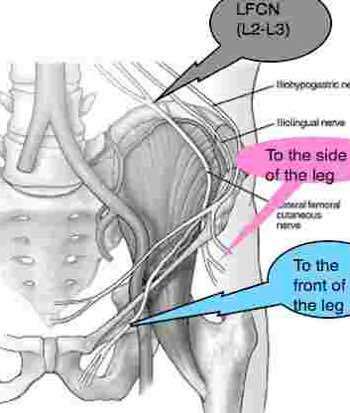 The LFCN arises from the L2 and 3 lumbar plexus. It emerges from the lateral border of the psoas major muscle, not shown, which joins with the the iliacus, seen in the graphic above. The nerve then proceeds obliquely across the pelvis, toward the so called ASIS, a hard bump about 15 cm above and slightly forwards from the hip bone. Read more about the lateral femoral cutaneous nerve and its importance in chiropractic practice. 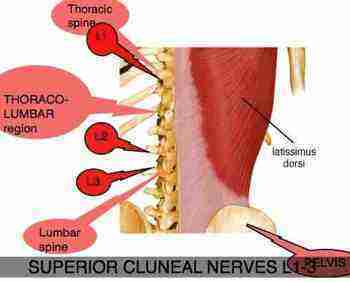 I increasingly begin treatment of the patient with low back pain with thoraco-lumbar adjusting. The upper lumbars are often fixated explaining why the side of hip (called the trochanteric region) is so often very painful. Commonly, Sacro-iliac joint fixations may be associated with Maignes syndrome. Clinically, one is faced with a chicken and egg situation. Do the pelvic conditions cause the thoraco-lumbar fixations? Or do the thoraco-lumbar fixations/ subluxations cause the Sacro-iliac syndromes and lumbar pain? Mostly, your chiropractor will pay careful attention to all areas of the lower spine and pelvis. Lumbar and buttock pain coming from the thoraco-lumbar region, Maignes Syndrome, is a notoriously difficult region to adjust. Thus you should be patient with your doctor. You may not immediately hear loud clicks, and dramatic relief of pain. 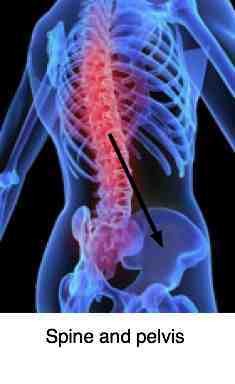 Common chiropractic adjustment techniques for this low back pain may include a straight straight down adjustment (whilst lying on your tum) which can be very painful, a hyper-extension technique (sitting or standing), a lumbar roll, McManis traction, an activator technique, Thompson drop and others. Do you enjoy light reading? 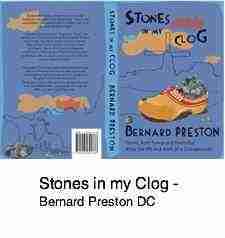 Chiropractor Bernard Preston writes excellent books about chiropractic and life. Described as "Gems, both funny and healthful, from the life and work of a Chiropractor" you will love these Chiropractic books. BERNARD PRESTON homepage. Another less commonly known technique in the treatment of Maignes syndrome is the supine hyperextension techique. Using a standard adjusting table, the pelvic section is raised to perhaps 45 degrees. The patients sits on the pelvic section with his hands behind his neck. The doctor places his hand behind the back at the fixated segment, flexes the torso slightly, and then makes the corrective adjustment in an anterior to posterior direction. Active trigger points will often be found in the Quadratus lumborum muscles, the TFL, the Gluteal muscles adding to the low back pain, and will be addressed by a variety of techniques. Hip hike, and pelvic tilt exercises (especially with the hands under the involved segments) are useful, as would alternating ice and heat treatment help with the lumbar pain. The examination was unremarkable in many respects. All the neurological and orthopaedic tests were negative. The previous practitioners had successfully treated the lumbar spine and the pelvis. But the pain remained. A raw, gnawing pain. X-rays didn't show much of interest, but indeed a moderate curve with the apex at the thoraco lumbar junction, where we found a massive fixation. It was solid as concrete. I don't diagnose it as Maignes Syndrome until the buttock pain has been successfully cleared by the thoraco-lumbar adjustment. Early in my career, I had the good fortune, to walk past an elderly chiropractor giving a colleague an adjustment at a chiropractic congress. I had never seen the technique before. Or since, for that matter, but I use it every day. I call it the FIST EXTENSION, simply because I know of no other name. I've only cracked four ribs in nearly thirty years in practice. One of them was using this technique! But it's fixed hundreds of Maigne's syndrome sufferers. Fortunately, a large bouquet of flowers, and a humble letter of apology saved my bacon. I suppose in America I would have had the pants sued off me, and those hundreds of people would still be suffering because I would be too afraid to use FIST EXTENSION again! Uncomfortable though the thought may be, if you are a smoker you WILL suffer from more low back pain, quite apart from the cancers associated with smoking. Strong research reveals that the lumbar arteries become furred in smokers reducing blood flow to the spine, and a strong correlation between smoking and lower back pain. Worse, you are likely to respond poorly to both chiropractic and surgical treatment for lower back pain. Low back pain and smoking is the greatest risk factor. Go from MAIGNE'S-SYNDROME to CHIROPRACTIC HELP home page. This is quite an emotive subject; every doctor of any ilk is likely to be upset on hearing that you have left or greener pastures on the other side of the hill. Yet, it shouldn't be so; every chiropractor has his strengths and his weaknesses too. You're likely to find there are chiropractors, and certainly medical doctors, who have never heard of Maignes's syndrome. I hadn't for the first twenty years of practice. It's easiest if there are several doctors in the practice; awkward perhaps but if you know you aren't getting better, it's best to discuss with him or her, could you consult a colleague for an evaluation. Chiropractors should have a thick skin and small egos. If they haven't, well that's their problem, not yours. So, if changing chiropractors seems sensible to you, don't hesitate. I have severe pain in left hip and groin, numbness in side of hip. Chronic Pain in left leg, hip, groin, upper thigh, calf and big toe. Low back pain that radiates into my hip down to my groin. Pain in my lower back radiating down the right buttock and leg. Burning pain in buttock. You'll have to give me some details, Teresa, if you want a serious answer. I can't suggest anything with this. Dr B.